Package Return is not a helpful browser extension. It is an advertisement-supported program that has been designed to showcase advertisements. As a matter of fact, this suspicious application does not offer other services, which is why it should not be so surprising that we recommend deleting this adware. Most users attempt to remove Package Return manually, but not all succeed. Continue reading to learn what removal obstacles you might come across and how to evade them. 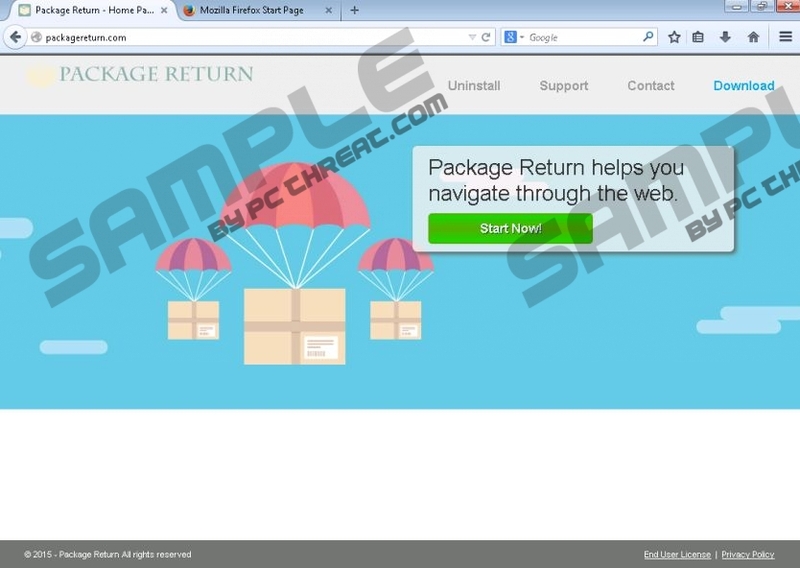 You cannot download Package Return from packagereturn.com, but you can download this SuperWeb LLC program bundled with other programs. Needless to say, unreliable adware is unlikely to travel packaged with reliable or useful software, and you need to inspect the programs downloaded onto your PC alongside Package Return to learn if you need to delete them. As our researchers have discovered, most SuperWeb programs, including Primary Color, Knowledge Gains, and Product Deals, come bundled with programs that must be removed. Once installed, Package Return shows commercial advertisements, coupons, discounts, and similar offers. It is most likely that you will find these offers attractive, because Package Return uses tracking cookies to track your browsing history and determine what kind of content you are likely to be interested in. Even if you remove Package Return cookies, you might be introduced to highly attractive deals. Note that not all advertisements will be identified with the tags "Ads by Package Return" and "Provided by Package Return." In fact, it is possible that not all ads shown to you will be disabled after you delete Package Return. As mentioned previously, Package Return is most likely to come packaged with third-party programs. Some of them might be identified as advertisement-supported programs as well. Needless to say, you must remove all adware from your operating system; otherwise, you will keep encountering potentially unreliable banner and pop-up ads regardless of which websites you browse. Of course, right now the removal of Package Return is most important to us. Have you attempted to delete Package Return, but the suspicious ads keep showing up? If this is the case, you must have missed some leftovers, or there are other infections you have not removed. You must remove all malicious programs from your PC to ensure that you can browse the web and run your operating system without facing security issues. If you cannot remove Package Return and other threats manually, go ahead and install an automated malware remover. In fact, using this software is the best thing for your virtual security. Navigate to the left of the Taskbar and click Start. Open the Control Panel menu and double-click Add or Remove Programs. Go to Change or Remove Programs and Remove Package Return. Click the Windows logo on the Taskbar and select Control Panel. Move to Uninstall a program and right-click the application you wish to delete. Click Uninstall to initiate the removal. Simultaneously tap Win+R to launch RUN and enter Control Panel. In the Control Panel menu go to Programs and click Uninstall a program. Find the application you wish to delete, right-click it, and select Uninstall. Quick & tested solution for Package Return removal.